When you fight for something your local government is trying to hide, you’re going to make some enemies. Sean’s Outpost purchased the property known as Satoshi Forest with the expectation that they would receive some backlash from not only the City of Pensacola and Escambia County, but also from residents in the Mayfair community where it is situated. The plans for Satoshi Forest were simple but controversial; turn the property into a campground where the homeless can reside free of interference from the police. In the months since Escambia County first cited Sean’s Outpost for code violations on Satoshi Forest, there has been a lot of concern over the future of this property. Even though recent inspections by the health department proved the conditions at Satoshi Forest were not in violation, the county maintained that there were violations under their dubious definitions. It didn’t help that residents view Satoshi Forest as a place that will bring crime to the already economically depressed area. There are philosophical debates to be had in all this; where do human rights have a place when it comes to public property? If it is illegal to camp on public property, why is camping also being restricted on private property? Luckily, the residents of Pensacola have shown their support for the work Sean’s Outpost does but the fight is far from over. 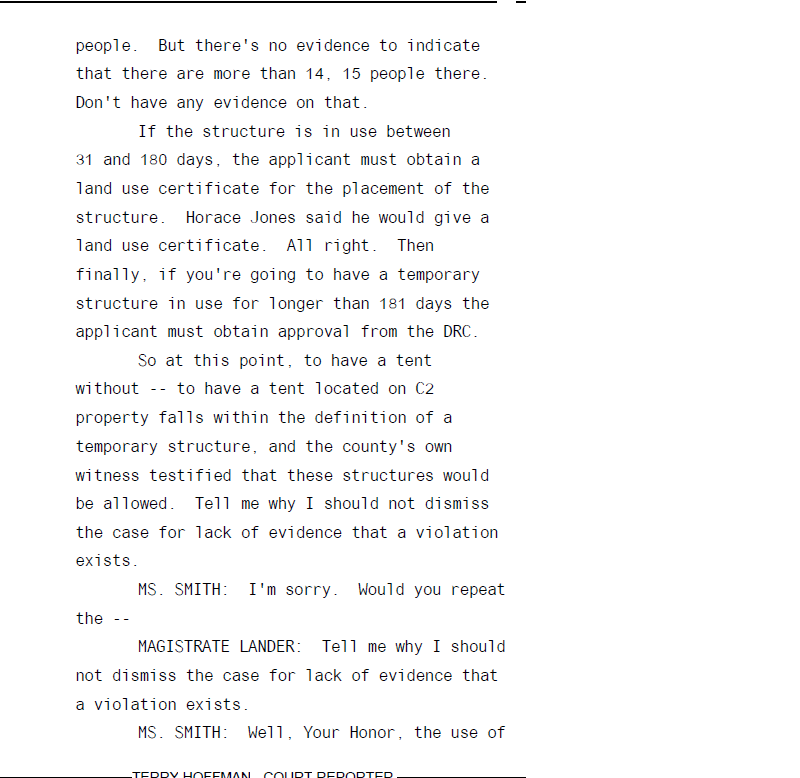 Last Tuesday, there was an evidentiary hearing before Special Magistrate Janet Lander that was to determine whether Satoshi Forest was in violation of current codes with what the county called “nuisance conditions.” The county claimed that tents were unpermitted structures that needed to be torn down until proper regulations were in place, that there was trash creating unsafe conditions, and that these violations should prohibit people from camping on the private property. After pictures were shown and code enforcement visited the property remarking how clean it was (it was previously used as a dumping area for trash), two of the five charges were dropped. 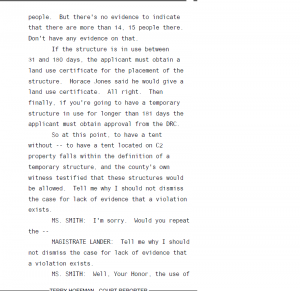 The rest of the transcript shows Mike Kimberl’s testimony and the county struggling to prove that tents are unpermitted structures and that Sean’s Outpost is in violation of Land Development code for having people camping there for unspecified amounts of time. The county was grasping at straws trying to shut down Satoshi Forest, but not even the magistrate was buying it. Fast forward to yesterday, April 22nd 2014: Special Magistrate Lander dismissed the county’s case against Sean’s Outpost. This is great news for the team, and we hope to continue to make progress on the property. Support is growing locally and Sean’s Outpost is much loved by the Bitcoin community. The struggle to help those in need continues, and this is not the end of the county’s harassment of Sean’s Outpost. While we had hoped that the ruling would alleviate some of the pressure on Sean’s Outpost, Escambia County filed a suit seeking a cease and desist order to remove all tents from the property until regulatory approval. This would mean throwing the twelve campers at Satoshi Forest out on the street where they could be arrested if caught sleeping on public property based on creative interpretations of current code. The suit not only targets the corporation of Sean’s Outpost, but also the primary individuals involved in running operations; Jason King, Leslie King, and Mike Kimberl. In a copy of the Circuit Court Complaint and Summons Mike Kimberl provided me, the county alleges that Sean’s Outpost is in violation of codes regulating campgrounds, and cites the same violations that the Special Magistrate ruled were not violations. This is typical behavior from the county as it seeks to not only attack an organization, but singles out individuals to harm financially. I will have more details on this situation as it develops. If you are in the Pensacola area, you can show your support by coming out to the hearings or volunteering. If you are a fellow Bitcoiner in a far-away land, considering coming to Bitcoin in the Beltway where you can hear me and others speak on a wide variety of topics and from which 10% of proceeds will go to benefit Sean’s Outpost.